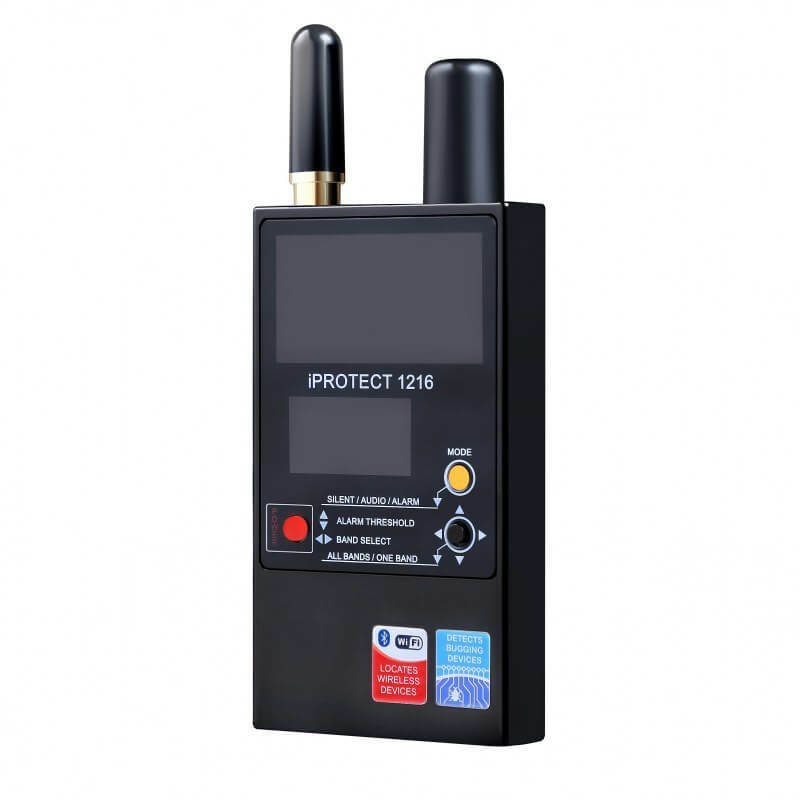 Digiscan Labs iProtect 1216 is a 3-band RF detector created for discovering different types of RF eavesdropping devices, including analog and digital. Comparing to the other detectors, the new iProtect 1216 RF detector comes with higher sensitivity to the 3G, Wi-Fi and Bluetooth bugging device and with an adjustable alarm threshold. 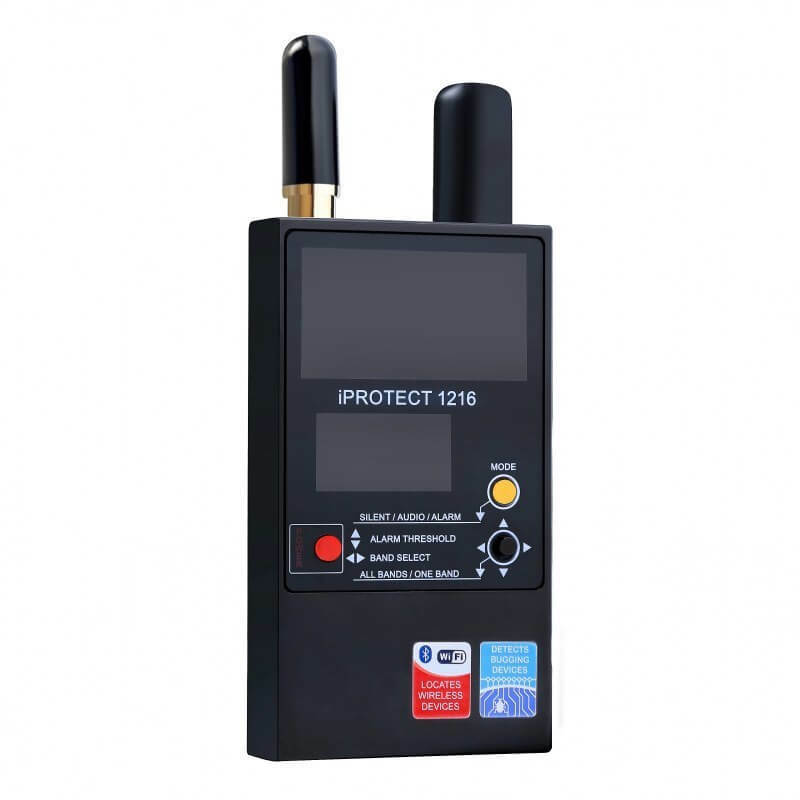 Comparing specifically to the Protect 1206i detector, iProtect 1216, among other features, also has a 3-band detection, which means that there are 3 parts of frequency range: 50-700 MHz, 700 MHz – 3 GHz and 3-12 GHz. In addition to that, it also has 3 working modes: silent, audio and alarm. Furthermore, comparing to other detectors, iProtect 1216 has clearer and more understandable user interface, which makes the device easier to use. 3-band detection - the frequency range consists of 3 parts: "VHF/UHF 50-700 MHz", "Mobile and wireless 700 MHz – 3 GHz" and "Microwave and wireless 3-12 GHz"
iProtect 1216 has the frequency range divided in 3 parts that are displayed by a separate bargraph: "VHF/UHF 50-700 MHz", "Mobile and wireless 700 MHz – 3 GHz" and "Microwave and wireless 3-12 GHz". 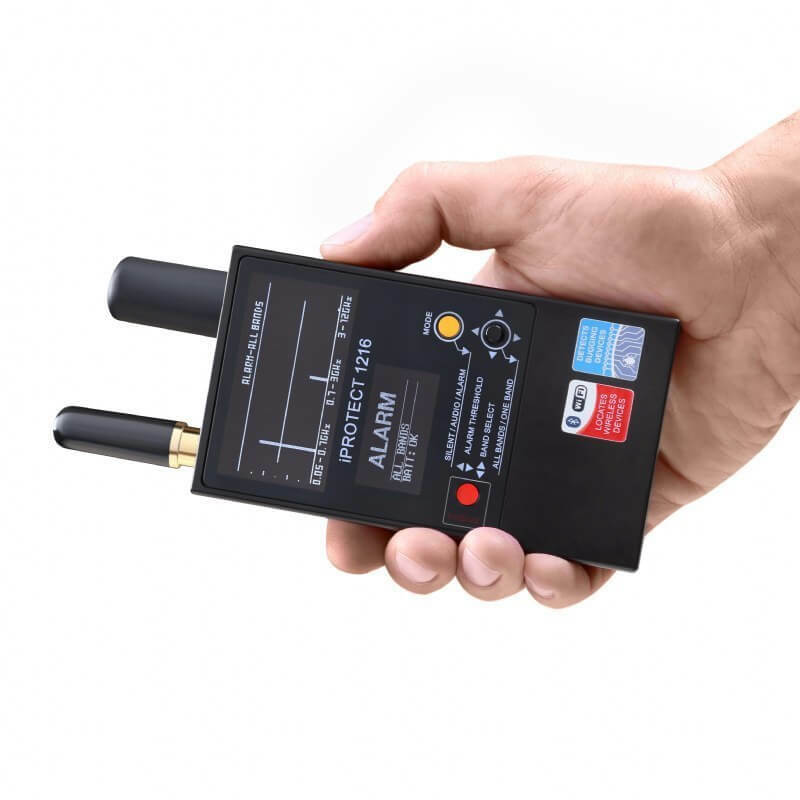 That allows better signal detection and detects several signals at the same time. One of the band is the "microwave" band that covers the 3-12 GHz frequency range. This band detects Wi-Fi and other wireless protocols operating at 5 GHz and on any higher frequencies. 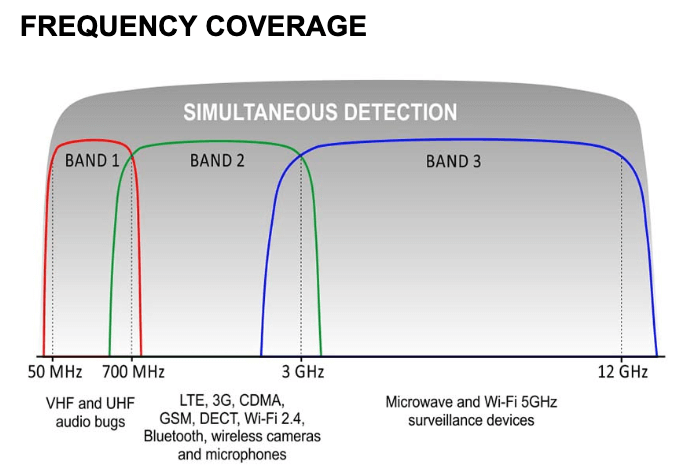 These frequencies are more covert because they are not detectable by common RF detectors. With this feature is possible to reject background interference by adjusting the threshold. An alerting sound is produced by the device when a signal exceeds the alarm. The histogram is shown when the device is in the ONE BAND display mode. It can draw the history of the signal obtained over the last 5 seconds. Comparing to the conventional RF detectors, the iProtect 1216 has a higher sensitivity to the 3G, Wi-Fi and Bluetooth bugging devices. That is achieved with additional radio frequency paths. The signature displays the possible signal type and shows a corresponding message on the display: cordless DECT device in an "idle” state, active DECT device, GSM, 3G, Wi-Fi/Bluetooth. For additional information regarding the iProtect 1216 please carefully study the PDF files offered for download below.